The SmartGuard™ layer made from a flexible, special rubber offers particular resistance to shards of glass and flints. Even a thumbtack cannot penetrate this protective layer. The SmartGuard belt does not increase rolling resistance. The MARATHON PLUS rolls as easily as a tyre without protection. I use these tyres for commuting to work. My route is littered with debris and the puncture protection is fantastic. I've had 4 pairs in the past 5 years and covered 16000 miles with very few issues. Highly recommended. Excellent tyres at a great price with fast delivery. I usually go with specilaized but these are hard wearing and perfect for my winter commutes. Brilliant tyre. Heavy but smooth rolling. Doubt I will get any puntures. Nice and grippy and predictable. 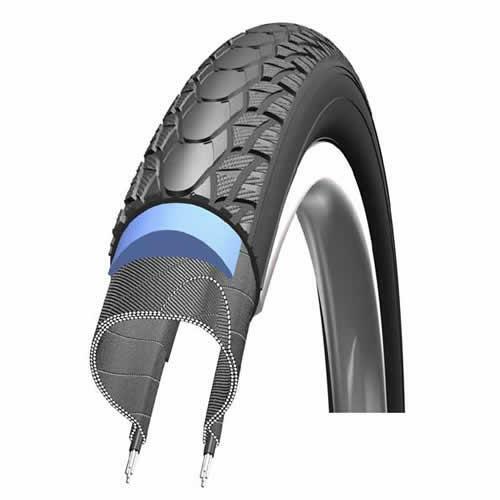 Not fitted to wife`s bike yet but we`ve used these tyres before and are perfect for town cycling, fast delivery. Brilliant. I have done over 8000 miles so far and expect another 2000 at least and all on a fully loaded tourer. Best of all not a single puncture. Used for 400 miles. Fitted to mountain bike due to mainly road and light trail use. Tyres roll very easily and much quieter than mud tyres. Plenty of road grip and quite good for light trail use. Easily fitted to a 29er wheel. Fast service from Merlin. Well recommended. Superb touring tyres. I have used this product for the last 20 plus years and would recommend them without hesitation. Marlins price is best on the market. So impressed, I bought another one. Since using these I am yet to get a puncture. Great Tyre, have been running this tyre for the last few weeks on the commute to work. No punctures so far! As always great service from Merlin. Cycling to work at 6am along 5 miles of thorn-laden lanes - essential. That blue belt is like Batfink's wings of steel :-) Steve C. Whitford. These are without doubt the best winter tyres on the market , totally bomb proof . Not had these long, they seem to roll well and grip is good.